An immediate job opening for Medical Assistant Modesto CA. Pain Management / Pain Medicine / EMG / Acupuncture clinic - fast paced, friendly, high-tech. Front office personnel: work comp insurance authorizations, patient scheduling and appointments, some back office tasks, etc. Bilingual (Spanish). Experience a plus. 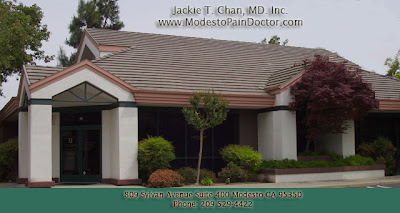 Details on Pain Management Modesto clinic. Post date: Aug 3, 2008. P.S. I'm not losing sleep over it. It's just that the resignation of the current m.a. was received during our vacation in Hong Kong and we just got back from Hong Kong; i.e. jet-lag. It's now 5:00 p.m. according to my internal clock (Hong Kong time), 2:00 a.m. local time in the US.